Our #1 most useful resource is a monetary donation. Every animal in our program receives medical care including vaccinations, spay/neuter, flea and tick medicine, and deworming, and emergency surgeries. Any monetary donations we receive are applied directly toward these treatments for our animals! Click on the donate link above to to donate toward the animals that we have in our program. If you are living on or visiting St. Kitts, feel free to donate to one of our officers in person or visit the Ross University Veterinary Clinic (RUVC) to apply your donation directly to our clinic bill. We can also always use puppy and adult wet and dry dog food, toys, and flea and tick prevention! To find out more about our community events, check out our Events Page. To show your support for SAFE and to raise awareness of our mission through merchandise, check out our Fundraising Page. We always need foster parents. 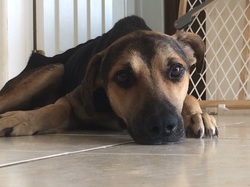 If you have experience with animals and can provide a safe, temporary home for one of our rescues on the island, please contact our foster coordinator in person or by email at fosters@safestkitts.org. Help us help them! If you would like to volunteer with S.A.F.E., we are in need of many more helping hands. We need help picking up donations, advertising animals, rescuing animals, and much more. If you’re able to help, please contact us via email.